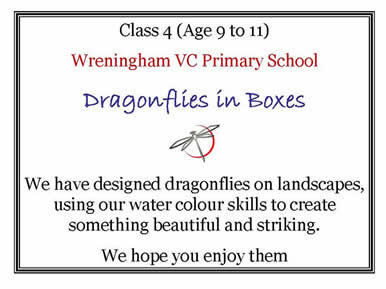 We were invited by The Norfolk Wildlife Trust (The Wymondham Nature Group) and The Leonard Cheshire care home to contribute dragonfly artwork to be displayed during their summer fund-raising fair. The whole school submitted a piece of art and residents of the home selected two winners from each class. Using our developing watercolour skills, imagination and lots of care and attention, Class 4 produced a whole swarm of delicate, beautiful dragonflies. We combined paper, tracing-paper, pastels, wires and watercolour paint to create some stunning pieces of art. Congratulations to Josephine and Erin, who were chosen as winner and runner-up respectively.